The Pittsburgh Steelers became the first Wild Card team to win a Super Bowl (the 1980 Oakland Raiders were the first team to do so in real life) with a 19-7 verdict over Green Bay, with four Roy Gerela field goals proving to be the difference in the game’s outcome. 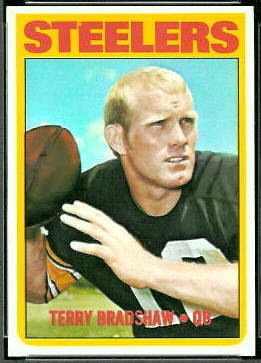 Terry Bradshaw won the MVP trophy for some key runs, not for his 8 for 20 passing effort, good for 141 yards. He run 6 times for 44 yards on top of that. The Steelers failed to make a turnover the entire game, scoring each of the three times they were inside the Green Bay 20, once for a touchdown, twice on Gerela field goals. Green Bay’s lone score was a 68 yard punt return by Ken Ellis, who ran two punts back for TD’s in the Packers 17-16 win over Washington in the divisional playoffs. Pittsburgh finished 12-5 on the year and takes home the Lombardi Trophy, while Green Bay finished 13-4. It will be the upstart Pittsburgh Steelers taking on the Green Bay Packers at the LA Coliseum for Super Bowl VII. Franco Harris broke the hearts of all the Dolphin fans in the southeast United States as a three yard run with 1:40 left gave the Steelers a 14-12 lead that held up for the win. The Dolphins couldn’t find the end zone all day and had to settle for four Garo Yepremian field goals for their scoring. Pittsburgh moves on to face the Cincinnati-Oakland winner on the road for the AFC Championship. The Dolphins, unlike their real life 1972 counterparts, finished 11-3-1 overall. Congratulations to the Eagles on winning Super Bowl XIV with a 24-10 win over Pittsburgh. The NFL 1979 project is complete, 233 games later. The Chargers “0” is no mo’. Pittsburgh makes it an all Keystone State Super Bowl XIV. Pittsburgh goes to 13-3, Buffalo to 8-8. That eliminates Buffalo from the playoffs, giving an AFC Wild Card slot to Denver. Pittsburgh goes to 12-3, Houston goes to 6-9. The Steelers are now 12-2, but can’t be the top AFC seed, and locked up the #2 slot weeks ago. Cincinnati to 5-9. Pittsburgh to 11-2, Cleveland out of playoff contention at 4-9.